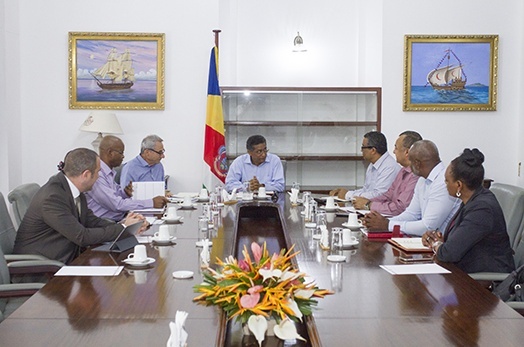 President Danny Faure met with the Board of the Seychelles Ports Authority (SPA) at State House today. President Faure started the meeting by commending the Board as well the staff of SPA for the good work they are doing and encouraged them to maintain both their discipline and leadership. During the meeting, the Chairperson of the Board, Commodore Paul Hodoul, expressed the appreciation from the members of the Board and staff of SPA for the support and visit of the President, which they profoundly valued. Mr Hodoul gave a full appraisal of the performance of SPA, on-going rehabilitation and extension of port Victoria and updates on the present status of the activities surrounding the port of Victoria. The Board members also shared with President some of the achievements and positive changes they have managed to contribute during their mandate as well as on on-going international cooperation. They also discussed their operations and constraints, which includes congestions at the port. Present at the meeting in addition to the Chairperson and Board members, was the Minister for Tourism, Civil Aviation, Ports and Marine, Mr Didier Dogley, and the Deputy CEO for Seychelles Ports Authority, Dr Egbert Moustache.